Once humans walked the world, building cities and creating empires, unlocking the secrets of magic and interfered with the Gods’ designs. For their arrogance and hubris in disrupting the Harmony, the Third Moon fell and humans were destroyed. Not long after this Maelstrom, the Bright Ones lifted up the simple animals of forest and field, giving them the ability to think, build, and stand on their own two feet. In order to keep the newly Favoured or Awakened animals from making the same mistakes the humans did, The Bright Ones gave them the Compact—a book telling them how to live together in Harmony. Yet there is tension between those of the Awakened who want to uphold Harmony and those who would explore the secrets of the Titans—as the humans are known, those who would use too much magic, or those who make too much use of metal alloys. The danger is that should one of the Favoured fall out of Harmony, then he may become a ‘dire’ creature and become a source of Disharmony itself thus threatening the Compact. This is the background to the Book of Cairn, an anthropomorphic RPG of community, responsibility, and doing the right thing. 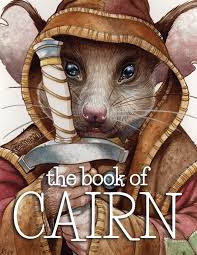 In Cairn, the players take on the roles of animal residents of the small town of Cairn—mice, otters, squirrels, beavers, even meerkats and duck billed platypi—who as Acrobat/Swashbucklers, Scholar/Wizards, Druid/Scouts, Cleric/Warriors, Barbarian/Minstrels, and other roles, work to protect the village, seek out sources of Disharmony, and uphold the Harmony of not only the village and surrounding lands, but also themselves. Originally developed by Mike Nystul—best known as the author of the horror game, The Whispering Vault and various titles for FASA—and funded through Kickstarter, Cairn was eventually published by Ross A. Isaacs and Souljar Games. Where the Kickstarter promised “A fuzzy fantasy RPG” and “A Fantasy RPG featuring woodland animals such as mice, badgers and hedgehogs as epic heroes. Tiny critters - Big Adventure!”, the final PDF (and print) version actually delivers something a little deeper than that. In addition, whilst it is possible to see the architecture of Dungeons & Dragons—particularly in the range of professions available, in having the player characters form parties and go off on adventures, and in it being a class and level system—underlying the game, mechanically, the Book of Cairn is a much lighter, more flexible game (and the better for it). In the Book of Cairn, the players play a range of animals, each of which can stand up right, has fully opposable thumbs, and is capable of speech. Each animal also has its own capabilities. For example, a Mouse is Chosen (meaning that he is more capable of withstanding Disharmony) and Small (reduced Hit Points and limited equipment, but also that he weighs less and takes up less space). Whereas the Armadillo is Big (more Hit Points and a better range of equipment), can Burrow, has Claws, can Curl (into a ball to increase his Defence), is Plated (natural armour), and has a better sense of Smell, but is Squinty (short-sighted). In addition to the stats, the place of every animal in the community is discussed, for example, Beavers work as architects, engineers, construction workers, and carpenters—even furniture makers, whilst Platypi tend to be sailors and fishermen. Also included is a useful guide on how to play each creature, with particular attention paid to a typical creature’s ‘Flight or Fight’ response. In addition to the twenty or so Creature options, a player has another twenty options in terms of Professions—from Acrobat, Alchemist, and Barbarian to Swashbuckler, Warrior, and Wizard. Besides telling what equipment a member of that Profession receives and the skills acquired every other level, each of the Professions has a Virtue/Vice whenever a character rolls a natural twelve for the associated action. When this happens, the character can choose to use it as a Virtue to benefit his friends and gain Harmony, or he can use it as a Vice to benefit himself, but lose Harmony. For example, the Marksman’s Virtue/Vice is Deadeye. As a Virtue, it means he shoots an arrow to distract an enemy who hesitates and so gives an opportunity for his friends to act, but as a Vice, his next arrow will land somewhere niggling and vexing to the enemy. To create a character in the Book of Cairn, a player selects an animal and decides how it is different to others of his species—faster, cuter, stronger, smarter, and so on. Then he decides on not one, but two Professions. He will gain the base abilities, Hit Points, and Magic Points from both, but will then alternate between each Profession in terms of ability, Hit Point, and Magic Point gain, the player deciding which is his primary Profession and which is his secondary Profession. It is possible to become a Specialist and effectively focus on a single Profession, but he whilst he will gain Hit Points and Magic Points every level, he will only gain abilities every other level. Some Professions—Druids, Enchanters, Healers, Priests, Sorcerers, and Wizards—can cast spells. Every Profession receives Magic Points, primarily because the Magic Points of a character’s non-spellcasting Profession complements those of his spellcasting Profession. Of course, there is nothing to stop a character selecting two spellcasting professions. In most cases, a character with a spellcasting Profession must purchase his spells and do so by permanently expending Magic Points. He must still temporarily expend Magic Points to actually cast the spells, so needs to balance the need to purchase spells and the need to power them. For the most part, spells in the Book of Cairn are anything other than flashy. The Priest, is of course, slightly different. It cannot be combined with the Sorcerer or Wizard Professions. Instead of purchasing spells, a Priest selects spells from one day to the next, investing Magic Points in them to cast later. Mechanically, the Book of Cairn is fairly simple and straightforward. When a character wants to take an action, he rolls a Test. If he needs to react against something, he rolls a Save. Either way, a character rolls a twelve-sided die and attempts to equal or beat a Difficulty—6 for Routine, 8 for Challenging, 10 for Heroic, and so on. Rolls of a natural twelve count as an overwhelming success, but a character will receive a +1 bonus for each appropriate element—Trait, Ability, Tool, and so forth— on his character sheet. For example, an Armadillo is Big and could use that to add a bonus when intimidating some rats. At the core of the Book of Cairn is the concept of Harmony. As a Favoured One, every character is—to some degree or other—in Harmony with the Compact and the community at large. Measured between one and twenty, if character’s Harmony is sixteen or more, he is said to be in a state of Grace; if between one and fifteen, he is in a state of Balance; if between zero and minus ten, he is in a state of Disharmony; and below that, he is in a Dire state! There are benefits to being in a state of Grace and penalties for being in a state of Disharmony, but once in a Dire state, a character becomes a source of Disharmony and an NPC! There are multiple ways in which a character can lose Harmony. For raising the stakes to gain re-rolls of Tests and Saves, for wearing and wielding arms, armour, and equipment made of metal alloys, for encountering sources of Disharmony, for acts of violence—especially when better alternatives are available, and for using magic. It can be gained for acts of heroism, kindness, generosity, and friendship as well as for defeating the Dire and the Unnatural. The biggest source of Harmony is not defeating the Dire or the Unnatural though force of arms, but rather addressing the sources of the Disharmony behind the Dire or Unnatural and thus restoring the natural balance. This is of course, more difficult than simply fighting it. Lastly, the Favoured Ones can engage in celebrations—and often do—and so regain Harmony. This can be anything from doing a small favour or cooking a meal for friends to meditating or participating in a festival. To return to the parallels with Dungeons & Dragons, Harmony and Disharmony is the equivalent of the Alignment system in the Book of Cairn. It is more mechanical in nature though and consists of two alignments—Harmony and Disharmony—compared to the nine found in Dungeons & Dragons. Naturally, the punishment of being in Disharmony is greater than the reward of being in Harmony, but the Harmony/Disharmony duality of the Book of Cairn is much simpler and easier to understand and it encourages and rewards positive behaviour and action. As does the Virtue/Vice mechanics for each Profession. This is the default set-up, and to be fair, Cain does not readily support others. So the GM will need to work hard if he wants to do something else with Cairn other than have the player characters working to keep their community safe and strong. The default community for the Book of Cairn is the eponymously named Cairn, a small town located where two rivers merge above an estuary. Named for the mysterious stack of stones piled up by the Titans, it is home to a range of bucolic creatures—Beavers, Otters, Mice, Squirrels, and so on. Of course this does not mean it cannot also be home to the odder Awakened—Duck Billed Platypi, Meerkats, Lorises, and so on. The description of Cairn focuses upon its primary buildings, such as the Town Hall, the Cider Mill Inn, and Professor Puddleleaf’s Observatory. Not only are these described, but they are each given six adventure hooks, each of which has the potential to improve the stats for the community and thus involve the characters in the life of the town. Physically, the Book of Cairn is nicely presented and the artwork has a certain charm. The same can also be said of the Book of Cairn as a whole. This is charm though—and not cute. For the danger in presenting an anthropomorphic fantasy RPG is that it turns into little more more than a cutesy, fuzzy version of Dungeons & Dragons, yet there is merit in the ‘fuzziness’ if not the ‘cute’, because the ‘fuzziness’ still makes the game accessible to a younger audience. Whilst this is true of Cairn, its emphasis is on community, Harmony, and non-violent solutions, actually makes it suitable for a younger audience as much as its ‘fuzziness’ does. Nevertheless, whilst there are strong parallels between Cairn and Dungeons & Dragons, they are not so strong that they threaten to smother Cairn. Rather, the Book of Cairn takes takes those parallels and develops them into strong motivations for player character action whilst coupling them with light and easy mechanics.